Although Kenya often appears in the press as a nation split by ethnic discord, it has just two “tribes”: the rich and the poor. In recent months, presidential politics have dominated the international coverage of Kenya — and for good reason. Political scions Uhuru Kenyatta and Raila Odinga — sons of the country’s first president and vice president, respectively — have squared off for the nation’s highest office in an environment swirling with legal battles, corruption, and state-sponsored violence. On August 8, the initial vote resulted in the first judicial nullification of a presidential election in the African continent’s history. And even after a rerun of the election last month — which returned Kenyatta to power amid a mass boycott — the political crisis hasn’t subsided. The issues animating the ongoing convulsion are complex. The nation’s colonial past, its struggles with authoritarianism, and its unequal development are all sources of contention. Kenyatta and Odinga’s ideological differences — rooted in their fathers’ political struggles over regionalism and inequality in the 1960s — also generate political conflict. But ask the average western pundit, and the battle is one over simple tribal loyalty. They refract the entire society through an ahistorical lens of ethnicity, divining in Kenya’s voting patterns blind ethnic allegiance. Ten years ago, Odinga and Kenyatta were on either sides of another disputed election. That time around, post-election violence left over one thousand dead and six hundred thousand internally displaced. And sure enough, western journalists promoted the idea that “an atavistic vein of tribal tension” was driving the country’s electoral strife. But Kenyan elections are more than a “ruthless game of thrones.” While ethnicity plays a role in stoking tensions at the polls, it cannot explain the nation’s political fissures. The victims of Kenya’s deep inequities are not any single cultural or regional group; they are the urban and rural poor. And their marginalization — a product of endemic corruption, repression, and pro-capital development — will continue adding fuel to the raging political fire. In a country where political elites are known by the fancy cars they own (wabenzi­ — those who drive Mercedes Benzes) and roughly 40 percent of the population lives below the poverty line, Kenyans recognize that, while they don’t all have a common language or religion, they share a landscape of growing inequality. 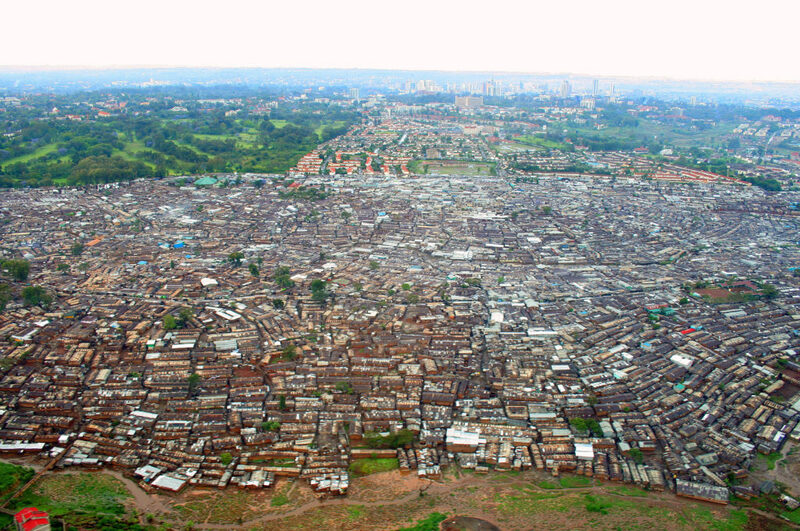 “Super highways” in Nairobi cut right through informal settlements that lack running water. Colonial-era country clubs sit against sprawling slums, where golf balls routinely ping off the roofs of makeshift tin shacks. The same elites strolling the nearby fairways often collect rent on the properties behind the concrete barriers. 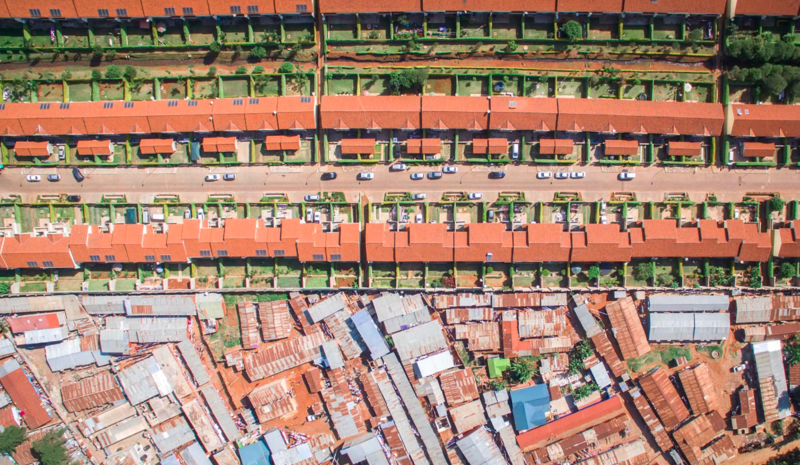 Rural areas are less starkly divided along class lines, but a number of Kenya’s less urban counties still suffer levels of inequality that would rank them among the most unequal nations in the world. Colonial-era country clubs sit against sprawling slums, where golf balls routinely ping off the roofs of makeshift tin shacks. Political elites stoke ethnic animosity to distract from these class divisions, repackaging the colonial policy of divide and rule in a postcolonial form. Their privileged status rests on keeping tribal schisms intact. Perhaps it is. But Kenyans have seen this movie before. For as long as Kenya’s been an independent country, the populist rhetoric of class solidarity has enjoyed moments of vibrancy, only to be silenced by brutal crackdowns. Mwangi and other activists are throwbacks to a previous era, when Kenyatta père and Odgina père battled over the direction of the young Kenyan state. In 1963, Kenyans threw off their colonial chains and began debating how to develop the country after decades of British rule. Settler colonialism had held back the predominantly rural population, squelching ordinary Kenyans’ potential under the boot of foreign dominance. Colonial politics of divide and rule were not simply about race. They also created class divides within local communities. Those deemed loyal to the state got more of the scraps from the table than others, and Britain ruled Kenya indirectly through appointed African officials at the local level. These colonial-imposed divisions boiled over during the struggle for independence in the 1950s. More than twenty thousand Kenyans died and tens of thousands more were placed in brutal internment camps during Kenya’s anticolonial Mau Mau rebellion. With fewer than fifty white settlers killed, it was a conflict that pitted Kenyan against Kenyan in a struggle for land, freedom, and opportunity. Mau Mau was crucial in the fight to liberate Kenya from colonial rule, but it also left deep scars within communities. For many, the first step toward healing these wounds was to repatriate millions of acres of rich agricultural land to the landless poor. Founding father Jomo Kenyatta, however, took a more limited approach. In a famous speech just a year after independence, he announced that “the future . . . is living, the past is dead.” He promoted “self help” and private investment through the Harambee movement. Literally meaning “to pull together,” Harambee called on citizens to raise private funds for local development. These initiatives stoked nationalist pride but reinforced a patronage system where elites had the power to decide when to dole out resources to the poor. Without widespread government programs for repatriation, Kenya relied on the willing-buyer-willing-seller approach to land reform. This allowed Kenyans who worked for the colonial government and the new postcolonial elite to buy up large tracts of land and reinforce their privileged positions. The landless poor who had fought for independence were largely left out. The public began to take notice of this corrupt system, and ideological tensions in Kenyatta’s Kenya African National Union (KANU) party came to a head. In 1966, a left-leaning KANU politician named Oginga Odinga split with the party and formed the Kenya People’s Union. Odinga and his allies framed their program within wider debates of African socialism. They wanted the government to take a more active role in the economy, for the state — not private citizens, as in Harambee — to be the engine of economic development. Unlike in neighboring Tanzania, socialist discourse never became official policy in Kenya. But it did influence critiques of regional favoritism and pro-business development, as well as the nation’s limited commitment to restoring land to those who lost it under colonial rule. Kenyatta would only bend so far, though. By the decade’s close, the upstart opposition party had been banned, the nation had become a de facto one-party state, and Kenyatta had mutated from founding father to postcolonial dictator. Kariuki was a former colonial detainee who still aligned himself with the veterans and peasant farmers of Mau Mau. A popular member of parliament with presidential ambitions, he had emerged from Kenyatta’s inner circle and, like the president, was Kikuyu. He also benefited personally from his elite political status. But his barbed attacks were too much for ruling elites. On March 2, 1975, Kariuki was reported missing from his Nairobi home, and days later his burnt body was discovered on a desolate road outside the city. For Kenyans activists, Kariuki still represents the failed promise of reform and the dangerous politics of dissent under one-party rule. Assassinated for his popularity and willingness to speak against inequality, Kariuki has become a martyr in a tradition that includes Pio Gama Pinto (1965), Tom Mboya (1969), and Robert Ouko, the foreign minister killed in 1990. In the 1980s and 1990s, struggles to end the one-party system intensified. While Kenyatta had died in 1978, his vice president, Daniel Arap Moi stepped in and continued many of his predecessor’s policies. An attempted coup in 1982 failed to bring down the government, and Moi imposed several rounds of detention on opposition stalwarts like Odinga and his son, Raila. In 2002, Moi still sat at the peak of power, having survived multiparty elections in 1992 and 1997. He expected to pass the presidential baton to Uhuru Kenyatta, whose political career he’d jumpstarted. But Uhuru lost the election, marking a turning point in Kenyan history. For the first time since independence, the opposition prevailed in a national contest. The key debates of that campaign still define Kenya’s political landscape. Those who voted to end the nearly forty years of KANU rule expected that the victor, Mwai Kibaki, would check presidential power, fight institutional corruption, and promote economic development to benefit the masses. During Kibaki’s two terms in office, Kenya enjoyed relatively high levels of economic growth. It also passed a new constitution by popular referendum in 2010. 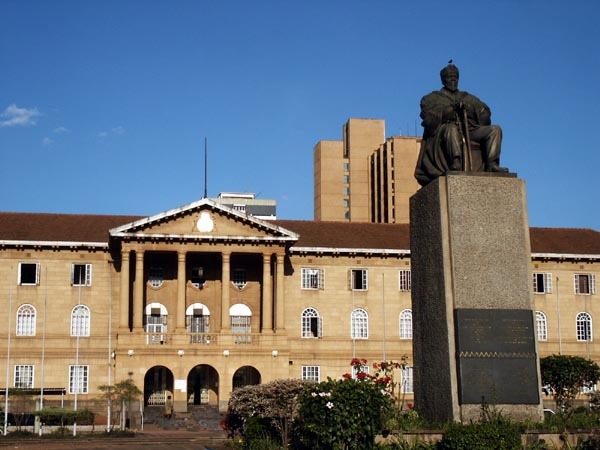 First implemented in 2013, the new constitution got rid of some vestiges of the old colonial system, which allowed the president to appoint local officials, and replaced it with forty-seven newly created counties ruled by elected governors and county assemblies. Kenya’s experiment with devolution became a key point of debate in the recent presidential campaign. The opposition claimed that Kenyatta was undermining the system, while other critics argued that devolution was exacerbating corruption by inventing new government coffers to mismanage and loot. In early August, with discussions about devolution and inequality hanging in the air, Kenyans went to the polls to elect leaders at the national and county level. The results of the local elections showed that voters are committed to devolution and suspicious of extending incumbents’ terms. On both sides of the political divide, voters widely supported local control of state resources, while booting twenty-four of forty-seven governors from office. At the national level, the presidential race was tight, and marred with controversy. After Kenya’s independent electoral commission declared Uhuru Kenyatta the winner with 54 percent of the vote, Odinga supporters took their complaints about electoral mischief first to the streets and then to court. 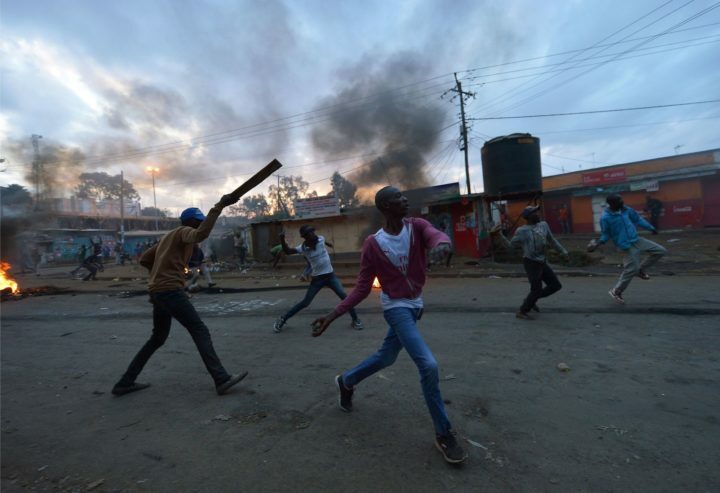 In opposition strongholds in Nairobi and parts of western Kenya, dozens were killed during peaceful protests and clashes with the police. Some observers rushed to explain the violence in terms of ethnic strife. Yet the country’s security forces have a history of targeting the poorest and most marginalized. And the post-election victims of police brutality were overwhelmingly residents of urban slums, where poverty unites even when language divides. On October 26, following a Supreme Court ruling nullifying the initial vote, Kenyans headed back to the polls. But there was just one problem: only 39 percent of registered voters turned out, compared to nearly 80 percent in August. The opposition had announced it would boycott the redo election. As a result, nearly 40 percent of constituencies had less than 20 percent voter turnout. Four counties did not hold elections at all. Odinga’s supporters have continued to challenge the results on the streets and in the courts. And while the Supreme Court recently dismissed three new petitions and upheld the election, the ruling has done little to quell tensions or halt confrontations with security forces. Kenya faces an ongoing crisis of legitimacy, and Kenyatta will face stiff opposition in his attempts to unite the country during his second term. The political convulsions in Kenya will persist as long as marginalization is framed in tribal terms. Indeed, the best election data we have indicates that inequality matters more to voters. At first glance, the data seems to support mainstream arguments about regional voting blocs and ethnicity. The twenty-four most unequal counties voted overwhelmingly for one candidate with few swing areas. 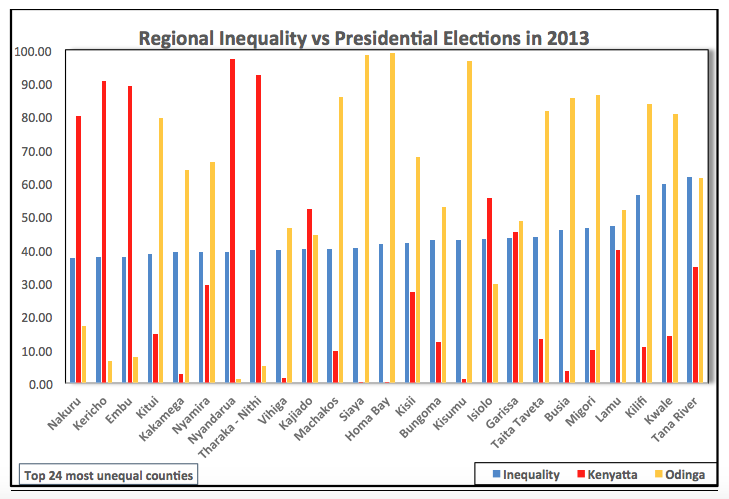 But a closer look reveals that Odinga won 75 percent in the most unequal counties, including the top eight. And when you compare voting patterns to county-level poverty data, you find that Odinga captured seventeen of the poorest twenty-four counties. Clearly ethnicity and class concerns are intertwined, but the most marginalized regions prefer Odinga’s economic vision to Kenyatta’s. Despite the media’s glib obsession with tribe, the average worker in Kenya earns $150 per month while members of parliament make nearly fifty times that amount. Electoral politics continue to function as a gatekeeper to wealth and power. And ordinary Kenyans, across ethnicity, know they’re getting a raw deal. Many have used inequality to critique the nation’s political order. Fortunately, the most marginalized are now using their ballots to contest this hierarchy and with it, Kenya’s politics of belonging. Matt Carotenuto is associate professor of history and coordinator of African studies at St Lawrence University in Canton, NY. He is the co-author of Obama and Kenya: Contested Histories and the Politics of Belonging in Kenya .